How often should the engine coolant be changed? The engine is the soul of any vehicle. In order for your vehicle to function well and live a long life, engine maintenance is key. Engine maintenance should be a regular part of preventive maintenance done for vehicles. Each car will have a different maintenance schedule recommended as per the demands of the model. This schedule, which is generally available in your owner’s manual, will also have details of engine maintenance and recommended rotation cycle for your engine coolant. Engine coolant is most commonly known as the antifreeze. It is fluid in the engine that absorbs all the heat that your engine produces and disperses it evenly – either through the radiator or via the heater used in the passenger seats. The coolant is made up an equal ratio of ethylene or propylene glycol and water. In order to prevent unexpected breakdowns, it is required to refill the engine and remove all the dust particles from the cooling system. Without proper maintenance, the engine coolant will not become susceptible to increased damage and corrosion. This will lead to the cooling system eventually blocking all passages through which the heat generated by the engine can leave and the engine will overheat. 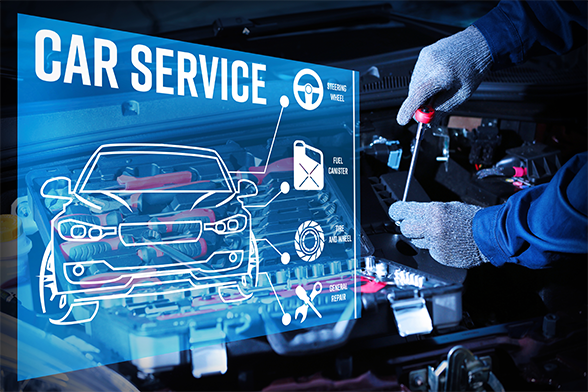 Thus, servicing the coolant is important for the health of your car. When servicing the coolant, it should be ensured that the entire cooling system is drained and flushed out thoroughly. Once this is done, a new coolant will have to be placed. Each manufacturer has a different guideline on how often a car engine should be changed. It is advised to consult with your owner’s manual and at the auto repair shop. As a general rule, however, the rule of 30,000 miles is applied for most vehicles and have been proven successful. The engine coolant for most vehicles is advised to be changed every 30,000 miles. There are other car models that require the engine to be changed every 60,000 miles as opposed to 30,000. Few models of Mercedes Benz even suggest that the engine coolant is changed only every 120,000 – 150,000 miles. Irrespective of the suggested coolant change schedule, it should be kept in mind that the driving habits and geographical terrains are also other factors that influence the condition of the engine. Thus, the engine coolant should be checked periodically during every preventive maintenance taking into account all the various external factors that can affect our car’s engine. Website by Arcpro Media Inc.